The Bf 109G (dubbed the 'Gustav' by German pilots) was introduced into service in the late summer of 1942 and came to be built in larger numbers than any other version, serving with more units, although its characteristics were such that it rapidly came to be regarded as Germany's second fighter, the Focke-Wulf Fw 190 equipping the most important units. The emergence of the Spitfire Mk IX and P-51D had finally shown the Bf 109 to be on the verge of obsolescence, and to counter this, Messerschmitt finally sacrificed handling and manoeuvrability for outright performance. The Gustav was thus powered by the much heavier 1,475 hp (1100 kW) DB 605A, although pre-production Bf 109G-0s retained the DB 601E. Basic armament remained two nose-mounted 7.92 mm (0.31 in) MG 17s and hub-firing 20 mm MG 151/20 cannon. The Bf 109G-1, with pressure cabin, was powered by the DB 605A-1 with GM-1 power boosting, and the tropical version, the Bf 109G-1/Trop, carried 13 mm (0.51 in) MG 131s in place of the MG 17s, necessitating larger breech blocks and giving rise to the nickname' Beule' (bump) on account of the raised fairings forward of the windscreen. The Bf 109G-2 dispensed with the pressure cabin and the Bf 109G-2/R1 was a fighter-bomber; the Bf 109G-3 was similar to the Bf 109G-1 but with FuG 16Z radio, and the Bf 109G-4 was an unpressurised version of the Bf 109G-3. The Bf 109G-5 introduced the DB 605D engine with MW-50 water-methanol power boosting (making possible a maximum power of 1,800 hp/1343 kW for combat bursts), while the Bf 109G-5/R2 featured a taller rudder and lengthened tailwheel leg in an effort to counter the aircraft's swing on take-off. Ever since the introduction of the Bf 109F had removed wing-mounted guns from the 109, a controversy had raged over how a fighter should be armed. In the hands of an expert the Bf 109F's three guns were adequate against fighter targets, but the quality of Luftwaffe gunnery training had steadily declined (young pilots being expected to learn most of their skills on the job) and the Bf 109's most important targets had become heavily armoured Russian Shturmoviks and large American bombers, making three relatively slow-firing guns clearly inadequate. 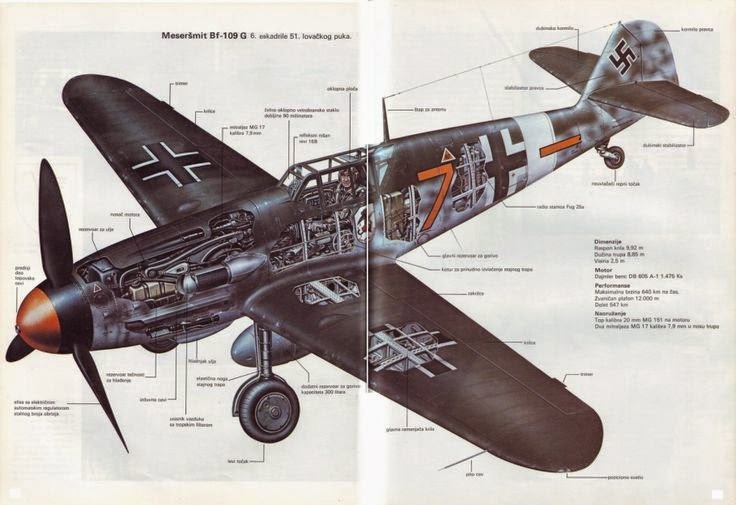 Therefore the Bf 109G-5 introduced a basic armament of a single hub-firing 30 mm MK 108 cannon, and two nose-mounted MG 131s, whose larger breech blocks were covered by the distinctive 'beulen'. Most important of all the 'Gustavs' was the Bf 109G-6 which, in various sub-variants, was powered by AM, AS, ASH, ASD or ASM versions of the DE 605 engine; with provision for two underwing 20 mm MG 151/20 guns. Numerous Rustsätze kits were produced to increase armament, including those to produce the Bf 109G-6/R1 fighter-bomber with a bomb load of up to 1,102 lbs (500 kg). Most aimed at improving the Bf 109's capability as a bomber-destroyer however, as the Defence of the Reich role steadily assumed greater importance. The Bf 109G-6/R2 bomber-destroyer had two 21 cm (8.27 in) WGr 210 'Dodel' rockets replacing the underwing cannon, while the Bf 109G-6/U4 (with an Umrust-Bausatz or factory conversion set) was armed with two 30 mm MK 108 underwing cannon, and the Bf 109G-6/U4N night-fighter carried radar. Tropicalised versions of most of these were also produced. The Bf 109G-7 was not built, but the Bf 109G-8 reconnaissance fighter formed part of the equipment of Nahaufklärungsgruppe 13 late in 1943 on the Channel coast. Fastest of all 'Gustavs' was the Bf 109G-10 with the DB 605D with MW-50 boost and bulged cockpit canopy (known as the 'Galland hood'), and a top speed of 429 mph (690 km/h) at 24,280 ft (7400 m); the Bf 109G-10/R2 and R6 possessed the revised tail and tailwheel assembly of the Bf 109G-5/R2 and were equipped with FuG 25a IFF equipment; the Bf 109G-10/U4 had provision for a belly gun pack containing two MK 108 30 mm guns, but this could be replaced by a non-jettisonable fuel tank known as the Inner Behalter. The Bf l09G-12 was a two-seat trainer, field-modified from the Bf 109G-1 to provide conversion training on the Schulejagdgeschwader, notably JG 101, 102, 104, 106, 107 and 108 in 1944. Last operational version was the 'universal' Bf 109G-14 with lightened fixed armament but with provision for external guns, WfrGr 210 rockets or bombs. The Bf 109G-16 heavily armoured ground-attack fighter-bomber entered production before Germany's surrender but did not see operational service. The Gustav formed the backbone of the Luftwaffe's last mass operation, the ill-fated Operation Bodenplatte, a mass attack against allied airfields in France, Belgium and Holland aimed at destroying troublesome USAAF and RAF fighter bombers on the ground. Unfortunately, the Luftwaffe fighters suffered heavy losses while inflicting little damage, while destroying General der Jagdflieger Adolf Galland's preferred plan ('Big Blow') which was conceived as a mass operation (with 1500-2000 fighters) to destroy 500+ US bombers, whose crews would be irreplaceable. Galland believed that allied fighter bombers would be quickly replaced, and that while pilots in Bodenplatte would inevitably fall into Allied hands, many pilots shot down in 'Big Blow' would parachute safely into German territory.